In 1950, HCM became the first to mass produce a mechanical excavator using purely Japanese technologies. With our excellent technical capabilities as a foundation, we continue to deliver innovative, highly reliable products that can resolve worldwide social issues. We constantly listen to the voices of customers so that we make construction machinery that is safer and more efficient for workers, and we are working collectively as a group to further increase site productivity. 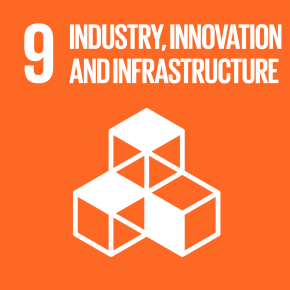 Expand technological innovation Continuous investment in technological innovation essential to the development and improvement of social infrastructure represents a vital element in sustainable economic growth and development. The HCM Group is working to develop technologies to differentiate itself, while securing safety and quality, to raise competitiveness through resource efficiency and improvements in environmentally friendly technologies. 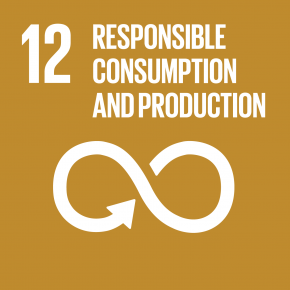 Disclose information to consumers Supplying products and services that are safe and environmentally friendly, along with conveying the correct information to consumers in an easy-to-understand manner, is vital in building sustainable forms of production and consumption. The HCM Group is endeavoring to further reinforce its customer-first quality assurance system recognizing that the above is an important responsibility of a construction machinery manufacturer. 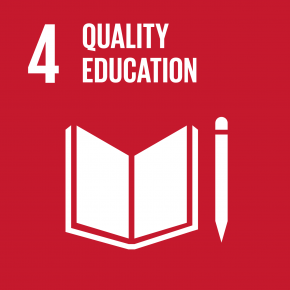 Transfer technologies through education High quality education and opportunities for lifelong learning must be accessible to everyone around the world. The HCM Group promotes increased technical levels inside and outside Japan, along with global, high quality technical and occupational training, regardless of nationality, age or gender, in order to supply products that meet the needs of each country and region in a timely manner. In FY2017, we focused efforts on “Global Monozukuri Diagnosis” activities and promoted improvements in the quality control system under the vision of “Made by Hitachi” uniform worldwide quality. Looking ahead, we will continue to work on advancing human resource development and support activities in order to pass down our accumulated technologies and use the initiatives of the Tsuchiura Works (the mother plant for the HCM Group) at our overseas location as well. The HCM Group is committed to delivering the same standard of safety and quality of products manufactured at all of its production sites around the world under the keywords “Made by Hitachi” through various efforts so as to supply products that truly delivery peace of mind. Our quality assurance system is headed by the Quality Assurance Center established at the Tsuchiura Works (the mother plant for the HCM Group) under the Corporate Quality Assurance Division. The center provides practical instructions and support to the quality assurance departments of HCM Group companies. 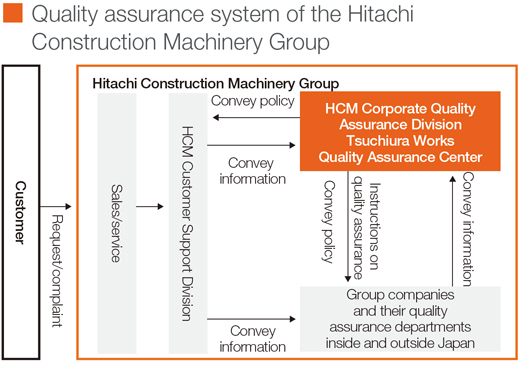 The Corporate Quality Assurance Division oversees the quality assurance operations of all production sites inside and outside of Japan, which ensures the entire HCM Group delivers and improves upon the same uniform level of quality to achieve the Made by Hitachi vision. In addition, the Corporate Quality Assurance Division collects and summarizes customer feedback and requests, comments from the sales and service frontlines as well as product deficiency information through the quality assurance division of processeach Group company. These are in turn reported at the monthly Product Improvement Meeting chaired by the President in order to investigate causes as well as discuss and propose measures to prevent their recurrence. Results are then applied to all products. We conduct a variety of employee education and assistance activities with the aim of standardizing quality assurance levels across the HCM Group inside and outside of Japan. We hold educational seminars to instill general knowledge on quality control including the Quality Control Course (Beginner/Intermediate), Reliability Engineering, and Product Safety/Product Liability Course. Moreover, the Global Quality Assurance Technician Training Program, which hosts trainees from overseas Group companies at the Tsuchiura Works to learn about quality control, has graduated 20 trainees to date. Currently, six trainees are undergoing training at the Quality Assurance Division at Tsuchiura Works over a one- to three-year period. Also, during Global Monozukuri Diagnosis activities in FY2017, a diagnostic technician for each of the processes at Tsuchiura Works, from assembly, machining, can manufacturing, painting, and quality control, visited 12 production sites around the world to visualize vulnerabilities in each of these sites’ manufacturing capabilities and quality control through diagnosis, and provide assistance for improvement to promote the realization of Made by Hitachi. The International Skills Competition is held annually in order to enhance skill levels across the HCM Group and secure a higher level of quality. 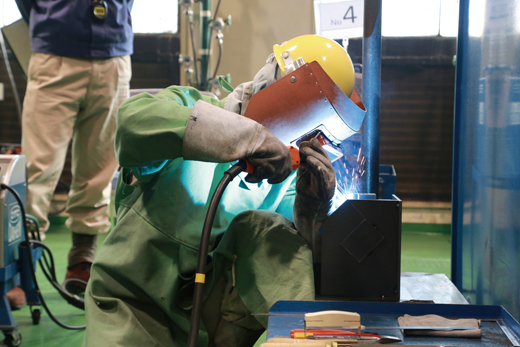 In FY2017, the 14th HCM Group International Skills Competition was held for two days on November 7 and 8, 2017 at the Kasumigaura Institute. A total of 78 people who won the earlier qualifying round took part in the competition to demonstrate their skills honed through daily practice. Participants represented 17 HCM Group companies and partners inside and outside of Japan (including 23 from five overseas production sites in China, India, Indonesia, the Netherlands, and Russia). The competition included a total of eight events; namely welding, painting, measurement, assembly, transport, processing, and welding robot, in addition to facility maintenance which was launched as a new official event in FY2017. The results indicate there is the growing number of winners from overseas production sites in each event, demonstrating the strong outcomes of the Made by Hitachi vision. Going forward, we will look to inject new excitement into such opportunities so as to improve the technical level of each site further and work toward enhancing product quality and safety.